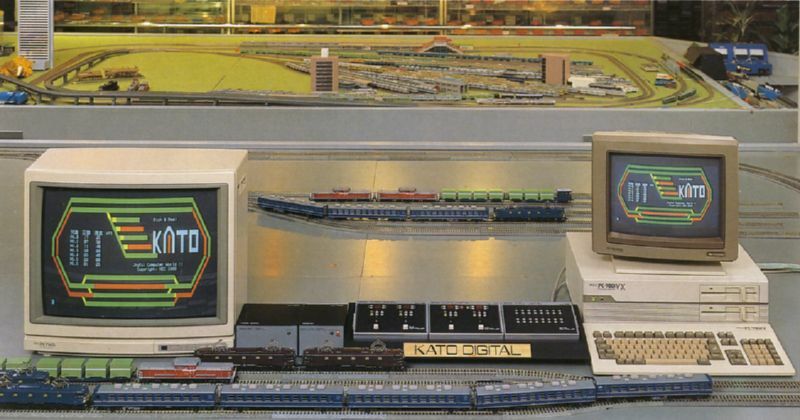 In the late 1980s Kato introduced a digital model train control system. In those days there was no standardisaton of such systems and Kato's system was propiatry like all others availlable in those days. It is quite clear that Kato's system didn't made it. The receivers would only fit in H0-scale locos, a serious drawback on a market where the much smaller N-scale is dominant. Although now obsolete, Kato did a clever job on the design. The control units plug-in on the side of a main unit, which contains the 'command station' and two slider controllers to control two trains simultaniously. Further sub-controllers add two more train controls. 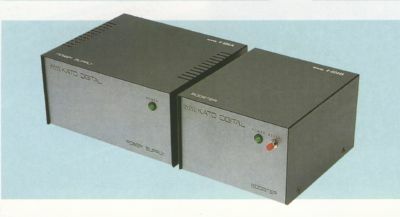 Switches (points) could be operated with a seperate switch controller (controls 16 switches) or by a computer (MS-DOS PC) via the RS-232 interface built-in in the main controller. 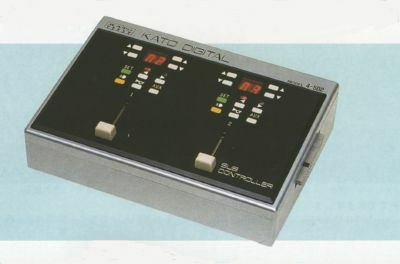 This digital control system was in the Kato catalogue until about 1992. 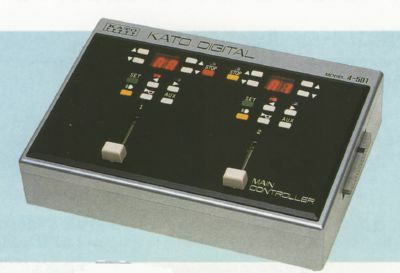 Later Kato co-operated with Digitrax and introduced the 'Zephyr' DCC controller. N-scale suitable DCC decoders became available through Digitrax and other manufacturers. Kato now also supplies decoder-fitted locos, trains and points via their 'Custom Shop'. 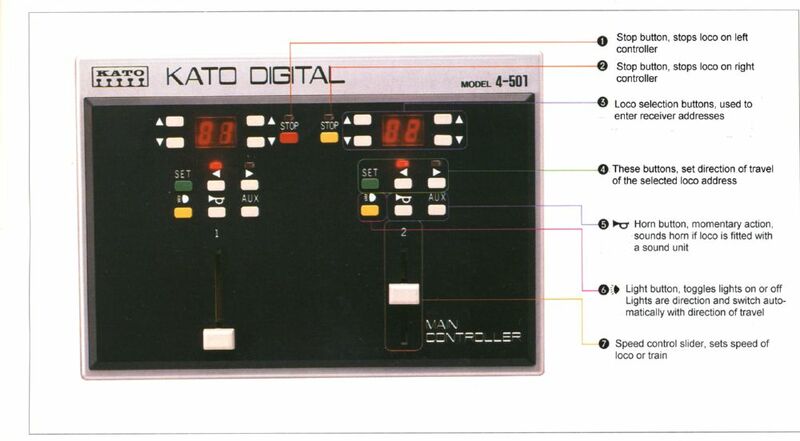 For the time of introduction Kato's digital systems was quite advanced, it had an adress capacity of 100 adresses (00 - 99), which was usual those days. It also had more function built-in in one control unit whereas the competion had 'one box for each function' or even bare circuit boards for the components of the control system. The image below gives an impression of the control unit. The main control unit, houses the circuitry to generate control signals and manages data traffic on the control buses. Two loco controls can be found on top of the unit. On the sides there are connectors to plug-in additional sub-controllers and switch controllers. This switch controller unit can control up to 16 switches. More switches could be controlled by adding an extra unit. Switches could also be controlled by a computer connected to the main controller via a RS-232 interface. Power to the system is supplied by this power supply (larger box on the left) and power to the tracks is supplied by the booster unit (smaller box on the right). Total power output is unkown, but judging from the case dimension I estimate that power output is about 5 Amps. Locos need receivers to decode the commands and Kato had supplied at least two different versions. Kato receiver A, made to fit their H0-scale DD51 diesel locomotive. Note the absence of surface-mounted electronic components and the bulbs fitted to the printed circuit board. Kato receiver C, smaller than reciever A. This reciever would fit most H0-scale locos, but is still large to 2006 standards. This buzzer unit provides a primitive form of sound output. 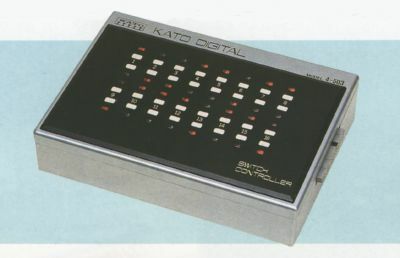 Kato's switch receiver. This unit is made to control Unitrack switches, with have a 2-wire connection and feature a special point-motor wich requires DC-pulses. The polarity of the DC-pulses determines the direction of the point blades. No system is complete without a guidebook. Kato's guidebook was only publised in Japanese. 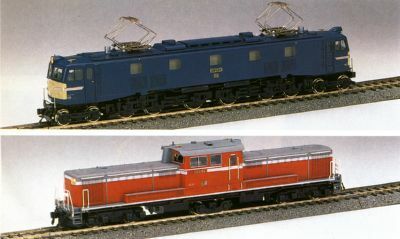 The 2 different locos that Kato supplied with a factory-fitted receiver. The electric loco at the top is an EF58 class 1500V DC electric locomotive, the diesel is a DD51 class diesel-hydraulic locomotive. The model news page. A quick overview of everything that is announced by the various manufactures plus site updates etc.